Featuring Nord's top-of-the-line 88-Note Weighted Hammer Action keybed, the Nord Stage 3 88 sets a new standard for live stage musicians. Th.. Featuring Nord's top-of-the-line 88-Note Weighted Hammer Action keybed, the Nord Stage 3 88 sets a new standard for live stage musicians. This is truly a performance keyboard like no other - with a lush Grand Piano Sound Library, Synth, Sampler and Organ Engine. Stage 3 leaves no stone unturned. The 5th generation of Nord's successful Stage Series, the Nord Stage 3 features their latest award-winning technologies including the Nord Lead A1 Synth Engine with sample playback, acclaimed Nord C2D Organ Engine, a greatly enhanced Piano Section, and extensive hands-on Effects. All rolled in one exceptional performance keyboard. The Nord Stage 3 features the acclaimed Nord Lead A1 Synth Engine, combined with Sample Playback and a dedicated OLED display. The Lead A1 synth engine is renowned for its analog-modelling warmth, and utilises brilliant Smart Oscillator Configurations to deliver stunning results with little programming. Single oscillator setups including Shape, FM, Ring Mod, Detune and Sync. Dual oscillator modes include Noise, Sine, Saw, Triangle and Square Mix. The Synth section also includes a brand new Oscillator category with massive “Super Waves”. The Nord Stage 3 Synth Section has powerful sample playback capabilities and comes with a wide selection of samples from the Nord Sample Library. All samples can be tweaked creatively inside the A1 Synth Engine and it is even possible to create and transfer your own samples using the Nord Sample Editor. The powerful Nord Stage 3 Effect Section features a wide range of instantly tweakable high quality effects including Tremolo, Phaser, Chorus, Pan, Wah, RM, Flanger and Vibe, all modelled after classic stomp boxes. 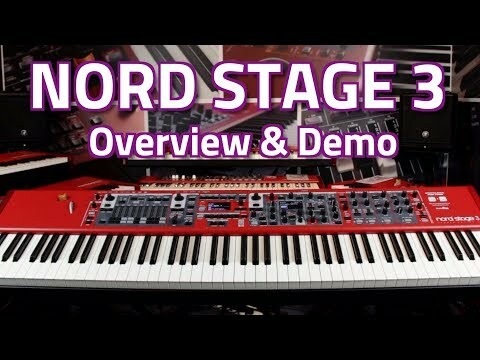 Nord Stage 3 Quick User Guide - 7 Cheats and Hacks!